HONOLULU (HawaiiNewsNow) - Multiple federal agencies and state regulators have built cases around investment adviser and former head of the Hawaii Republican Party, David Chang, sources tell Hawaii News Now. 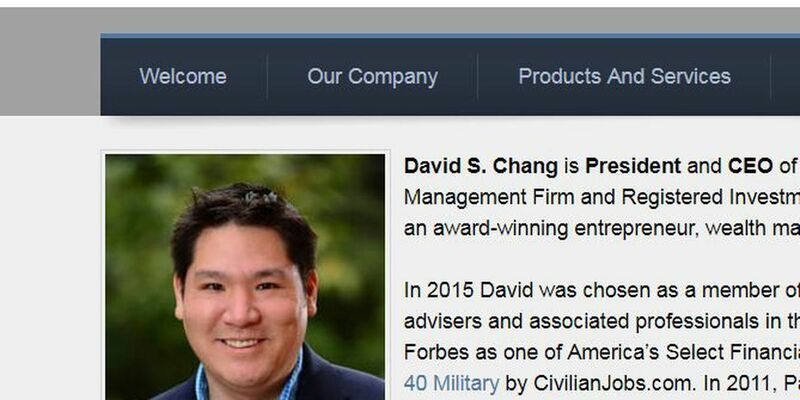 Chang owns Chang Holding -- the parent company of several businesses, including his multi-million dollar investment firm, Wealthbridge Inc. which he says has 700 accounts all over the world. Law enforcement sources say, over the past two years, the FBI and investigators with Homeland Security and the State Department of Commerce and Consumer Affairs have investigated Chang after complaints that he misled clients by guaranteeing high returns. One of those clients says Chang owes him $250,000. "One day we got a knock at the door, and I mean just totally out of the blue, and it was somebody from the FBI," says a former investor who did not want his name used. He describes Chang as charismatic and says he trusted him with his life savings. "By looking at surface things, he looked like a clean cut patriotic guy," says the investor, "A graduate of West Point (United States Military Academy) he served a tour in in the war on terror and was the head of the Republican Party of Hawaii... He also went to seminary." The investor says he was guaranteed a high rate of return. A promissory note obtained by Hawaii News Now appears to be signed by Chang and notifies the client that his initial $100,000 investment will pay 15 percent interest. When the investor started asking for his money back, he says Chang couldn't honor the promissory note. "He'd say right now he was working on multi-million dollar deals or even in the billions. He would sometimes say that I'd just have to hold tight, interest was accruing." Interest was accruing if you read the statements from the company they invested in, Just Black Holdings, or JBH. But the statements were apparently sent after the company was listed as "terminated" or "delinquent" on the state's DCCA website. "He cheated me out of my life savings," the investor says. A source close to the investigation -- who also did not want his name used -- tells Hawaii News Now he believes those statements were not properly prepared, "At the time he was producing and providing those statements to the individual investors, he was well aware those funds had been lost." The source says the money for JBH had already been spent. "I believe once he discovered he was under investigation he began to try to repay the investors from the first scheme by soliciting investors into another scheme." Law enforcement sources say the cases are taking a long time because few people are willing to complain on the record. At least one investor was willing to sue Chang, saying she put 175-thousand dollars in JBH in 2012, with the promise that she'd get 10% back two years later. Court documents say, when the promissory note expired, Chang persuaded her to wait and extend, four times. By April of 2016, four years after the investment was made, she finally demanded her money back. That same month, sources say, Chang sent an email to his staff, which Hawaii News Now has obtained and confirmed it is part of the state and federal investigations. The email tells his employees that two, elderly sisters were collectively putting $238,000 in another Chang Holding company -- Home Care Solutions -- to pay, in advance, for their long-term health care. The email appears to order the money to be divided into four parts, with $100,000 to JBH. Court records show, the woman who sued then got $100,000 from JBH, the same month. The woman has settled the case with Chang and did not respond to our efforts for comment. What's unclear is how Chang - after apparently spreading the elderly duo's money around -- was going to cover the health care they pre-paid for. "In a conversation that was recorded by the FBI, it was determined that Mr. Chang said if he had to provide the care for them himself or his family members, then that's what he would do," says our source close to the investigations. Despite the multiple investigations, Chang has not been arrested or charged. And he continues to operate and recruit new clients. His website says that he was featured in Forbes magazine as one of "America's financial leaders." The May 2014 issue is displayed next to that statement. However, Hawaii News Now bought that Forbes edition, and couldn't verify that any such article exists. HNN did ask the various federal and state agencies for comment regarding the investigation but they declined. The former investor Hawaii News Now interviewed says he's hopeful he will someday get his money back, but doubts that will happen. "There's anxiety about the future, some depression," he explains, "I thought I'd have some money and be able to travel... and go back to school but now, that's out of the question." "Unfortunately, my counsel has advised me that I am unable to directly address these allegations while an inquiry is ongoing. What I can say is that I have always operated my business at the highest standards, always put the interests of my clients first, and have stayed true to my values of honesty, hard work, and service." More are taking the perilous journey to the sacred place.